Texting My Pancreas: I'm Not Sick, But I'm Not Well. It's tough to say where it started; I only know that it's here, now. A need to force a smile. Joker's block. (That's like 'writer's block', but for humor, right?) A propensity to tear up at the small things (which, actually, is how I am all the time). More than one person asking lately, "Are you okay? ", with me dismissing their concern. I hesitate to call it depression - because I've felt that before, and what I'm feeling now both disseminates far less deeply and disappears far more quickly. I'm thankful for my friends who share their experiences with depression, because it causes me to be more self-aware of my own state of things, and it helps me feel more okay about seeking help if that should be the case for me. (And this time, it really is me, not you guys.) But no, I don't think it's that. Not this time. It's a general sense of "feeling down", and it's looming like a small raincloud over my head these past few weeks. Like Eeyore, but less endearing. I'm working my way through it, day by day. Whether my mood actually becomes better or just becomes more manageable - I'm not sure. The difference here, and most of the reason I'm fairly certain this is more "being down" and not "being depressed", is that I am more equipped to work on these things. And - this being the big part - I don't let my stubbornness get in the way of deciding to act on those. I can recognize myself feeling this way about a particular aspect of life, and within a relatively short amount of time, I can say to myself "Okay, I can either continue to be mopey, or I can actually do something to improve my situation." I can identify tangible things I can do to help myself - for example, frustration with a current job could translate to brushing up the resumé and looking at what else is out there - instead of allowing myself to aimlessly wallow. The part I've come to now is more difficult - dealing with the things I cannot effectively change. In the past week I've experienced loss of two sorts: an old friend, my age who had also had T1, passed away (not sure if that played into what happened or not), and I've gone through the emotional roller coaster with family as my sister-in-law first learned she was pregnant, and subsequently found she had miscarried. There are other situations as well. I'm not sure what I'm really trying to say, other than to say that I'm here, and I'm waddling through a bit of stuff at the moment. Writing this also helps me mark down when I've felt this way - blogs are often an online journal, after all. I'm reminding myself that I'm not powerless to work on some of it, and perhaps I just need to be a bit more patient with other aspects. And the rest? I'm not sure, but I'm doing what I can to deal with it in a healthy way. Thanks for sharing your struggles. Please know even when you're feeling cloudy, you are an absolute light in this world. First, kudos for using the word staccato in a non-music blog. I'm so sorry to hear about your friend and your sis-in-law. I was talking to someone this weekend who was feeling a lot like you describe. I said, "You're an empath". She said, "I know! I'm like a sponge, soaking up everything everyone is experiencing, and letting it affect me". We talked about it for a while, and we decided that it's not good to be too much of a sponge, or to put up a shield to deflect your feelings from everything (I'm pointing at myself now). For what it's worth, I think I would rather be a sponge than a shield. Something about better to feel something rather than nothing at all, and from pain we can understand joy all the better. Here's hoping you'll see happier days in the very near future. I think there is a certain heroism in plugging along through times like this, one foot in front of the other, doing the best we can. Please continue to know that I admire you, and wish you luck in breaking through the fog. (Your graphic reminds me of my favorite Eeyore line: "It's all the same from the bottom of the river." And, thank you for the shout-out. So sorry to hear about your friend and sister-in-law. It's hard to lose someone you love (especially someone your own age) and while it's hard now I promise you (from recent experience) it will get better...though not as quickly as you would like it to! Life is a series of peaks and valleys, much like blood sugar! :) The important thing is that you recognize your feelings, accept them, and then move on. Step 3 might take a lot longer than steps 1 and 2 but it will happen. I am so sorry to hear about your friend and sister-in-law. (((hug))) I hope the cloud passes soon and it's replaced by a rainbow and sunshine. I'm so sorry to hear of your losses Kim. Being down makes it hard to admit to yourself that you are working on it, but to me it seems that you are working very hard to feel better. Somethings are out of our control, a lot of things actually and to badly paraphrase an old parable "Sometimes one must stand tall like the oak against the raging torrent of our lives other times we must bend like the willow and allow the change to wash over us, through us, around us until we are able to stand tall again." first of all, i immediately started singing the song in my head as soon as i saw your post title. that's normal, right? i am so sorry things are difficult for you right now. that's a lot of loss to deal with in a short amount of time. sending lots of love your way. I totally get the "being down vs. being depressed" difference. In this past year, in these past couple years, I've been going back and forth between both spots and currently would be "being down". I don't feel hopeless or unmotivated to change, but I don't feel good either. It's hard not to feel that way when bad news and stress is piling on you, either. many hugs and yes, it's good that you recognize the piling on and stopping it from overwhelming you. Oh honey, I'm so sorry you are feeling this way. I wish I had some answers or profound advice for you . . . . unfortunately I just tend to muddle through as best I can. But I'm here for you if you need to talk or vent or a friendly ear to listen. <3 U!! Thank you for sharing this, Kim. I've gone through a lot over the past 6-7 months and it piled on top of me. From losing my home, and being homeless for 2 months and family issues. I've been having the same "feeling down, not feeling depressed" for a couple months now. This blog post came at the perfect time for me to read it and it really helped me. I really hope you get back on track soon! Thank you! Hi friend. I'm so sorry you are going through this. I can honestly say I've been there, and I understand. I'm proud of you for blogging it, because encouragement helps. And you are making a difference -- look at these comments! I ended up taking a small dose of meds for my "feeling down" but not depressed moment. It helped when I needed it. I love you as a dear friend. I wish you could the you that I see! i am sorry to hear of your recent losses and struggles. but i am glad you shared them here and i hope in doing so you feel some relief. hang in there, we've got your back. 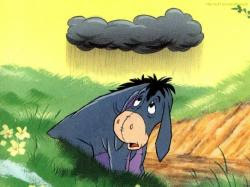 ps, i love the fact that you use eeyore and harvey danger to help illustrate what you're going through.